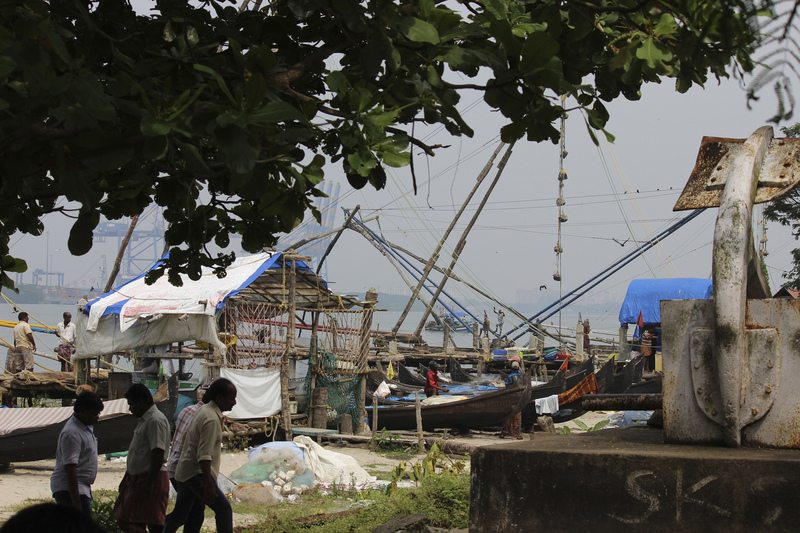 Beam (2015), is a sound installation by British sound artist Cathy Lane at the Artry Gallery, Kochi, which brings a confluence of sound, sea and harbor into a succinct and minimalistic impression. Sound waves, light waves and waves from the Arabian seas intersect to speculate and reflect on the much ignored space of the maritime world. The past and present stories of the harbor are told using sound, an art medium which often remains in the background in a visually dominated world. Although a niche art fraternity, and Lane being one of them, artists have focused and experimented on sound art passionately. It is a more appropriate medium in the context of a sea shore and harbor, where the relentless sound of the wave is eternally there, even if all else is silent around it. Indeed, we hear the sea before we see the sea. Beam was a satellite exhibition to the Kochi Biennale’s “Whorled Exploration” Feb 2015 and a part of “Dialogic Assem-blages” curated by Meena Vari, with research conducted by a team from the Srishti Institute of Art, Design and Technology, Bangalore. Lane’s work speculates on the old Kochi port and the new Dubai port-which remains at a distance-but is very much a part of Kochi and exists in its vicinity. The sound installation remembers the vibrant colonial harbor and the now fading port, including labor problems. Through this installation, Lane not only sculpts sound, but also investigates its possibility to recall the past through what she calls “sonic traces”. This is indeed a challenging task where she strives to draw the past from the present sonic traces that she assembles in her installation. She observes that maritime space is a forgotten space, insulating and hiding itself. In part, my essay will speculate on the inscrutable aspects of this space suggested enigmatically in Lane’s work, which often leads to the intrigue that usually surround corruptions and illegal activities. Therefore, examining Beam through Lane’s modernist form is consistent with her enigmatic inquiry and she sustains them through fragments which impede absolute or fixed analysis. She is simultaneously commenting on the sound medium even while engaging with the ports and their predicaments. Similarly, my inquiry is concerned with such intersections. Finally, I will connect her insistence on using sound to theorize the “ears”-our hearing instruments- through Jacques Derrida and Michel Leiris’ ‘Tympan’ from Margins of Philosophy (1982). In effect, I demonstrate that sound waves, light waves, and oceanic waves will reveal that the wave form is fundamental to all living and nonliving entities and that we are surrounded by them not only on the oceans and seas, but also while we are on terra firma. Cathy Lane, Beam1, 2015. Courtesy the artist. 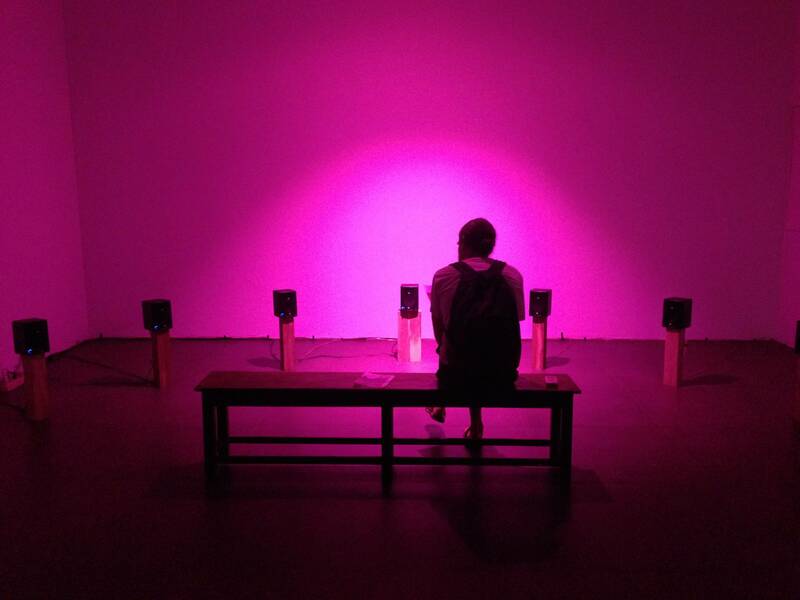 Lane’s sound installation at the Artry Gallery was in a darkened space, with a deep violet/pink hue radiating from below as if from a horizon, which vaguely recalls a color mingled in the dusky sky when the sun is setting, thus signaling the “sinking” port and an oblique reference to communism that has partly contributed to the decline of the port. Beam is a spectrograph of sound with clear and unclear fragments of conversations, where low pitched murmurings mingle with the eternal rhythm of the waves. The colonial past and post colonial present collapses into sound images through sound montage and intersections. Beam sensitively responds to the port’s past-present by considering its history marked by vibrant colonial trade, that drained its vitality on its departure and has left behind the fading remains of the present—an almost unsustainable port. Cathy Lane, 2015. Courtesy the artist. Lane’s work on maritime issues evokes memories, and therefore connects to two other British artists, Isaac Julien’s Ten Thousand Waves, (2010) and John Akomphrah’s Vertigo Sea (2015). Unlike Lane who uses only sound, these artists work with both sound and visuals. Julien in his Ten Thousand Waves (2010) recalls the Moracambe Bay Tragedy where several Fujian Chinese cockle pickers were drowned by an incoming tidal wave. John Akomphrah’s works retell the stories of migrants and other current illicit activities on the sea. Similarly, Lane engages with the maritime world in her works. Her work however can be linked far more to Allan Sekula’s across the Atlantic, who probes like a detective and examines exploitative economics and labor systems that continue to haunt maritime geographies since colonial times, and perhaps from even before. Sekula probes like a detective because maritime activities are increasingly made less visible with technological upgradation. In his monoskop Fish Story (1995) and film Forgotton Space (2004), he is looking at fading ports from another era, entangled with technologically upgraded harbors of the present, changing the seascape and landscape simultaneously. Most certainly, ongoing exploitation morphs labor and continues to exploit vulnerable third world economies. Lane engages with similar issues, but speculates with her modernist approach, which not only keeps her medium focused on sound, but fragments the information obtained from live interviews and other archival material. Her approach problematizes them and stimulates the audience to speculate like her to form impressions of the context. Indeed, her work sustains speculations and blocks easy answers, which resonate with the current inscrutable conditions of harbors. Both Lane and Sekula begin with the premise that the oceans and seas are “forgotten spaces.” Not simply because we are indulging in air and land transport and that their visibility therefore marks our consciousness, but also because the maritime business is insulating and “hiding” itself. The shipping businesses go beyond trade and commerce to easily include the illegal and illicit activities it “harbors”. (Will return to these activities soon) Most of the goods we use are transported by sea and yet there is a silence about it. Sekula’s Fish Story (1995) and his film The Forgotten Space on the maritime world underscored how very little attention is given to business done on oceans. He states that 90% of the goods we use are transported through sea routes. He thus anticipates Lane who uses sound scapes themselves to address this silence over a very vital part of our lives. The lighthouse was Lane’s inspiration and the mysteriousness attached to this object brought her to the sea and sound. Almost ironically, Lane moves from light towards sound to produce sound installations: The Hebrides Suite (2013) in Hebrides, an archipelago off the North West coast of Scotland and the more recent Beam (2015). In the Hebrides, she examines the dislocation and dispossession of the local population, whose elimination happened in the name of development; new economies displacing the old. 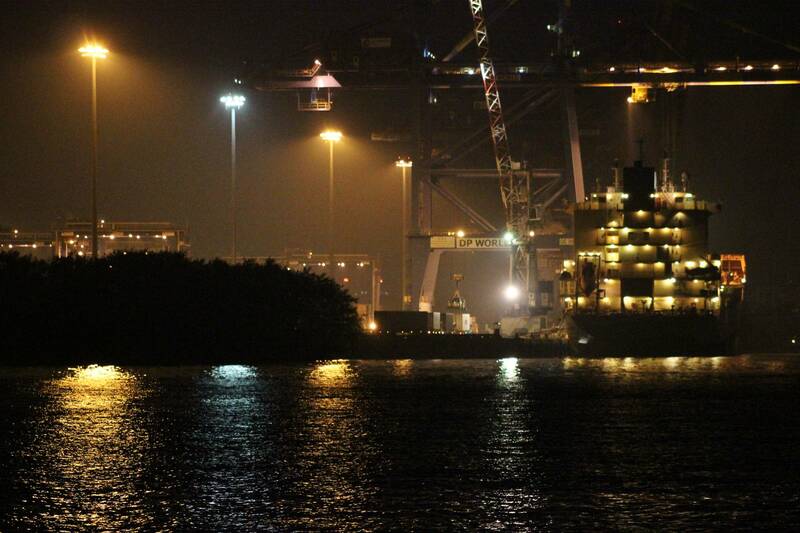 In Kochi, Beam explores the precarious predicament of the Kochi port. Light, the very necessary force for visibility, is displaced with sound, in order to hear the story of the sea. Lane longs to visit the lighthouse like the children in Woolf’s To the Lighthouse (1927), but she goes there to “switch off” the light beam—all the better to hear. Her work blocked out film projection -a two-dimensional delimiting rectangular cut out- although a film was made as a supplement to the sound installation. A stunning reverse supplement, because often sound is “supplement” to images or relegated to the background of visual medium(s). 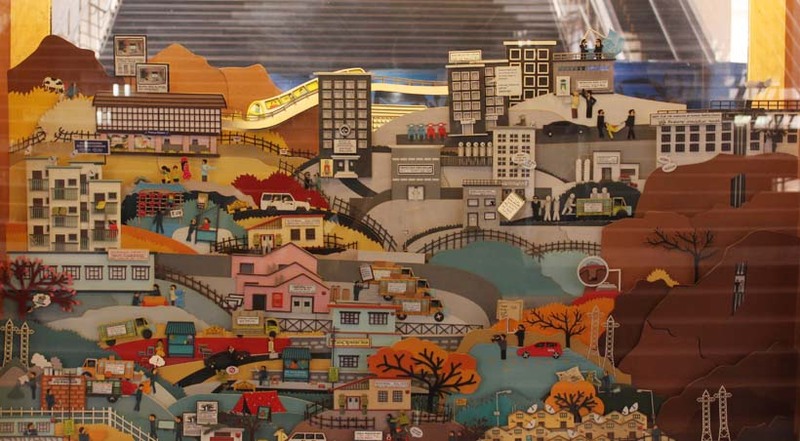 Lane, who wants to exclusively emphasize sound, insisted on removing the moving image at an earlier installation in December 2014 at the UB City, Bangalore exhibition. In effect, light is converted to sound beams; light waves are deterritorialized and transformed into rhythmic sound waves that move freely all over in space. Rhythmic mechanical sounds from the ship and the gushing and gurgling waves that wash over the shore are heard from seven “speakers” arranged on the floor in the form of a crescent. The number seven is alluding to the Waves (1931) by Woolf, where it is a leitmotif for the seven cycles of waves, days of the week, notes in music and colors in a spectrum. Lane in a conversation expressed that she was always drawn to lighthouses and acknowledges her affinity to Woolf’s works, which largely centered on water, sea and ocean and certainly to Woolf’s To the Lighthouse (1927). This work by Woolf’s was set in the geographical space in the Inner Hebrides on the Isle of Skye. Lane alludes to her own work The Hebrides in her Beam through the lighthouse. Her work interweaves several fragments of the harbor sound and conversations that are thoughts and observation, similar to the modernist form of Woolf, who through stream of consciousness and fragmentation, gave more an impression and experience of the context and thus leaves them suspended and unresolved in the mind of the reader. Such formal strategies begin and end with ellipses and are structured through commas and defer periods. Lane’s investigations towards the conceptualization of Beam made her question and wonder about the neglect of lighthouses in Kochi. Lighthouses are well maintained in the west, and she in a conversation observes the way they are preserved in England, where people go to visit them. A certain romantic imagination and nostalgia for the lighthouses is a cultural specificity sustained by structuring them accordingly, and making it accessible to the public as a monument. The public visits the lighthouse to relive the culturally prescribed romantic experience. Kochi is outside such cultural signification and hence lets the lighthouse remain as nothing more than a functional space, or even less than that, for they seem to be lying in neglect. Perhaps the socio-economic conditions of the harbor in Kochi do not have the privilege (s) that romantic imagination and nostalgia affords. Several strands of sounds intersect into a polyphonic effect in Beam. The conversations we hear follow a rhythm through sonic intensities regulated by their decibels, pitch, frequency and tone of the voices along with the recurring waves; like the waves they rise, fall and fade away into eternities. Murmurings, high pitched codes and signal transmission are interspersed with discussions on labor issues, mundane activities on the harbor, and the next to nothing or little information about the unapproachable Dubai port was gained indirectly from the old Kochi port as hearsay. Cathy Lane, Dubai Port, 2015. Courtesy the artist. 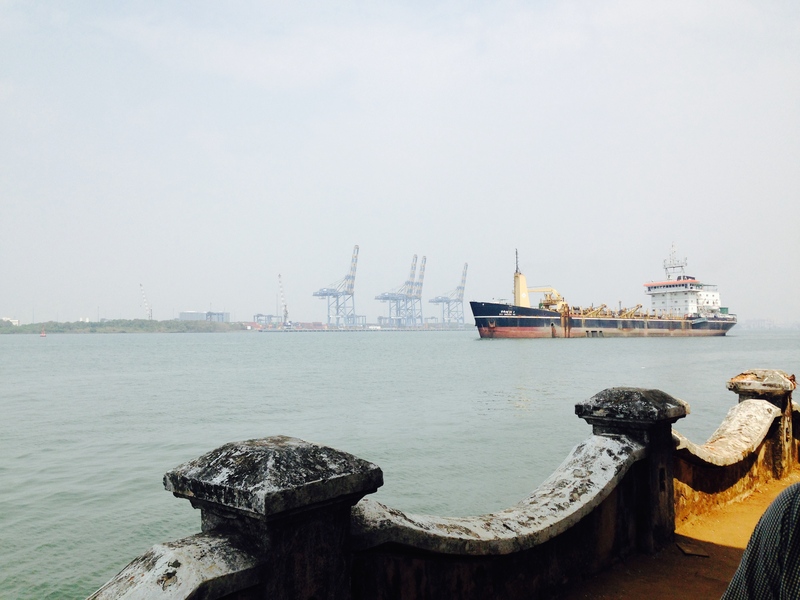 It is more recently the “Kochi” port is “harboring” the Dubai port with substantial technological up-gradation, perhaps a strategization of the economic dilemma of the old Kochi port. Literal and figurative distance and distancing of the Dubai port is enhanced by strictly guarding it against potential trespassers, making it an inscrutable presence hovering in the distant horizon. The Dubai port with a private labor system shields itself by remaining aloof from the old Kochi port and its Marxist driven labor system, although this is perhaps not the only reason for its distance. The less than cooperative labor force with political inclinations of a state riddled by Marxism is disabling vigorous trade and commerce necessary for its sustainability. However, interspersed in the conversations, one also notes how Marxism has simultaneously protected the daily wage laborers with a relatively higher income, in comparison to other states in India. 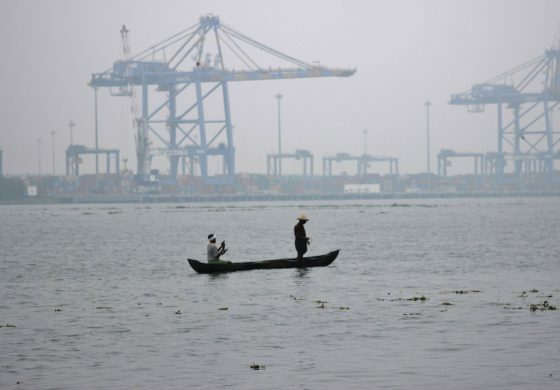 The precarious port is struggling to remain as a “port,” fighting against nature that is undoing the harbor, and consuming enormous expenditure from dredging which does not ameliorate the economics of the port. However, Sekula in his Fish Story reasons that increasingly, docking requires such locations, and ironically, despite dredging, they are convenient zones for containers to upload and transport in the current format. 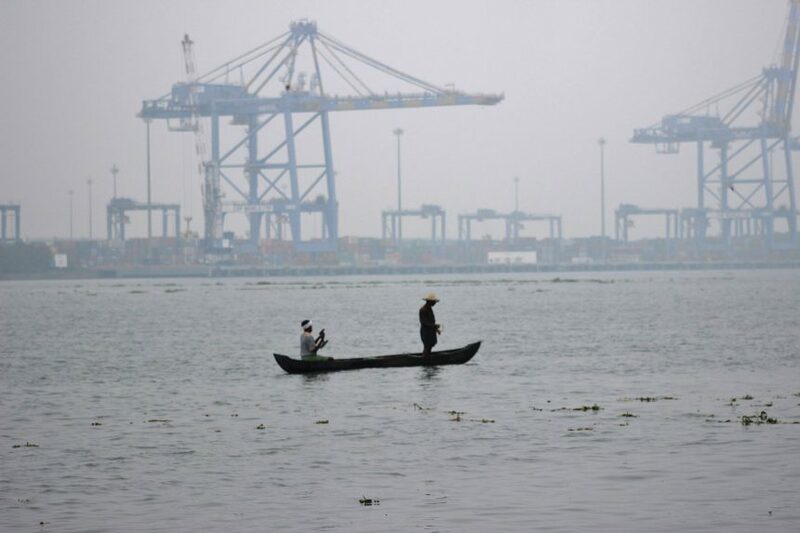 First of all, this means the apparent disconnect between the Dubai and Kochi port is not so clear. Is the Dubai port apparently being kept far away to avoid the labor force and the issues thereupon and yet close enough through the old port for convenient collaborations? Secondly, why continue to sustain an unsustainable port? Is it to drain out the old port and in turn, the incompatible labor format in the present economic system? Seemingly these ports are distant from each other, but their clandestine entanglements are safeguarded by willful separation. So, is this also a port that overrides harbor policies and labor laws for the convenience of corporates and governments? For instance, certain first world countries use third world ports to circumvent labor laws or policies, and one reason is in order to use cheap labor, which may not be possible in their home countries (Fish Story, 1995). One of the technological up-gradations comes in the name of containers – they are large rectangular enclosures made of corrugated steel – transporting thrice packed goods that contribute to making the port business more opaque. Sekula called this process ‘containerization.” Containerization and such packing make it difficult to check what goes into them, so they are random, and often, not rigorous. This lack of transparency further distances the port from the viewers. Containerization is not limited to ships, but continues to influence the designing of other land transport vehicles. Similar shapes and design of the containers continue to configure on to other land transport vehicles like the goods trucks, which are becoming larger and longer on highways. 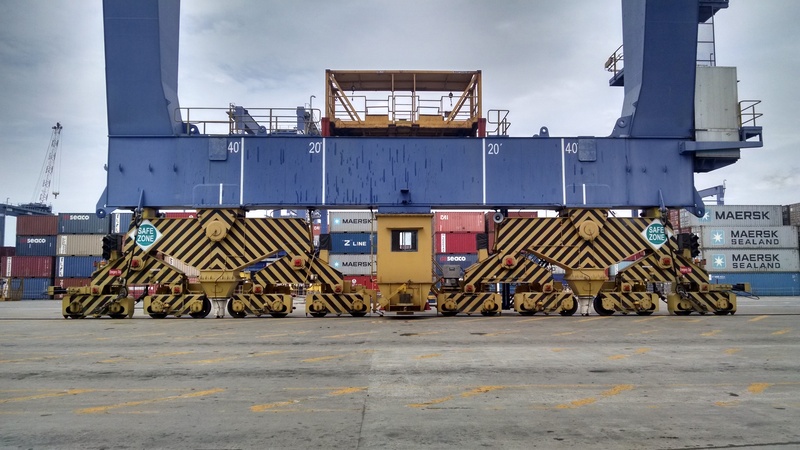 It is as simple as attaching the containers from the ship to the trucks, that do not have a body, but merely a platform on the wheels of a truck where the container can slide on them with ease. They also resemble the carriages in a train, where again these containers can be easily latched on to goods trains as carriages. Indeed the task of unloading and uploading the goods and thus revealing the contents of the containers is overcome in its transition from one mode of transportation to the other. This easing of the transportation of goods from sea to land and vice versa is done efficiently, effortlessly and most importantly, without scrutiny. 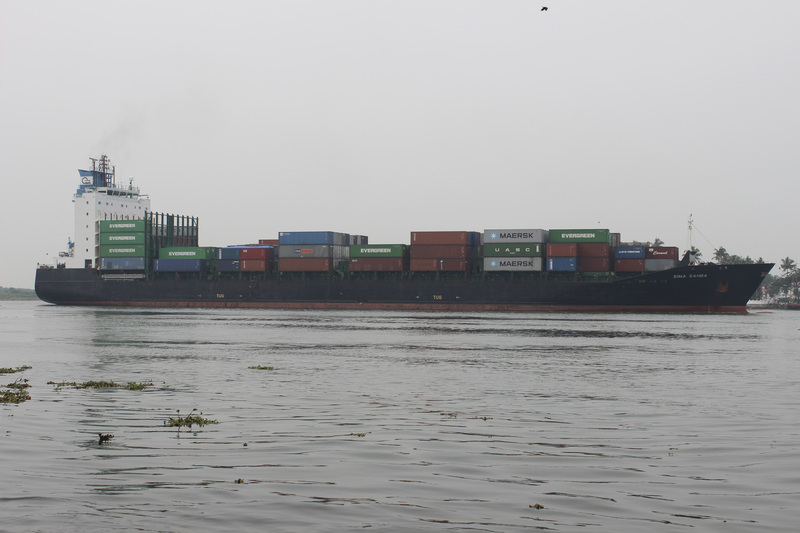 Sekula’s motif of containerization has proportionately created larger ships. These floating islands are not merely engaging in trade, but are also enclosures for illegal and illicit activities, facilitated by remaining in isolation for long periods of time on the vast ocean. Illegal immigrants and other questionable materials are enclosed in these rectangular “coffins.” Indeed, media and other sources reveal that they transport dead bodies, drugs and weapons elsewhere to avoid legal investigations. Often migrant workers are transported in such containers to UK, Europe and US for cheap labor and many die in them, due to suffocation and starvation. Julien’s account of the Morecambe Bay tragedy in his Ten Thousand Waves (2010) recalls the death of 21 Chinese undocumented cockle pickers. It alludes to transportation of them by containers to the Bay to work for David Eden and his son who are in the cockle business. The migrant workers were drowned by an incoming tide after picking cockles. The Eden’s had sourced them through a Chinese gang-master who was convicted for the murder of the cockle pickers, but the father son team was cleared of breaching immigration law. (BBC news, 2014). Lane’s work was contextualized amidst such themes of ongoing globalization and exploitation in the Biennale. Therefore, her enigmatic work that partially reveals, but nevertheless, consistently insists on the inscrutable and insulated maritime world, provides an opening to link with other works which answer her question: What is hidden? As argued by Michel Foucault, perhaps since the Enlightenment, the precedence of the eye over ears, and indeed, its prominence over all other sense organs is a compelling philosophical observation. At any rate, telescope, microscope, stethoscope, periscope and other ‘scopes’ easily demonstrate this precedence in science and technology; for the visual arts, the camera with photography and cinema has exponentially increased the density of images and reinforced the eye, but repressed sound as a background medium (particularly classical Hollywood cinema). The age of mechanical and digital reproduction emphasized visuals and they continued to reign in museums and exhibition spaces, despite the simultaneous development of sound technology and sound art. However, experimental and contemporary art forms since John Cage have engaged with sound for its own sake. To listen to Cathy Lane’s work Beam, also means to become conscious of the morphological and physiological structure of the listening instrument—the conch like EAR. This instrument bears an uncanny resemblance to the sea conch. Conches carry a refrain from the ocean to the human ear and it captures a fraction of the eternal sound of waves. The seven speakers are like sea conches that transmit fragments of the rhythm from the Arabian Sea. Lane channels the sound composition to pulsate and go beyond idle listening: a repetitive rhythm that lingers like a refrain from a musical piece. The assemblage of sound units composed in the Beam reach the concha (shell like) outer ear, which is then transmitted to the inner ear cochlea (which also resembles the interior of a conch with the spiraling pathway). Indeed, an uncanny resemblance links the sea object and our listening instrument; once again a Deleuzian deterritorialization that links the land with the ocean. The conch is shaped by the waves, resembles the waves, and contains and transmits the sound wave. So is the morphology of human conch, including other parts of the ear, that are wavy on the inside and outside of the ear. The ear also contains otoliths, the small calcified granulation and holds endolymph, a liquid, and both are required for human balance while walking, dancing etc. Perhaps, the liquid and calcified granulations are from the sea and held in the ears thus dissolving the breach between the sea and the land. Michel Lieris, a poet and philosopher, who co-wrote the “Tympan” with Derrida, will continue the deterritorializing process where he disperses the waves from the ocean to discern them across the earth by locating it in the living and non-living. He isolates this form and locates them on the land and the living. He goes deep under the earth from the wavy worms, the undulating earth crust, sand dunes, to the tendril on plants, human brain, entrails, curly hair and the double helix of the DNA material upto the clouds in the sky. Indeed, it is well known that the morphology of sound itself is in the form of waves. Endless whorling destinations of the sea and ocean was gathered in the precisely titled exhibition, Whorled Explorations, as exemplified by Anish Kapoor’s Descension (2014), a water vortex that creates a circular center with an unknowable abysmal depth. In sum, the waves are not limited to the oceans and seas, but exist as light waves and sound waves all over the world. Indeed we live or swim in them; not to mention other waves with harmful frequencies that are increasingly populating around us, with technology and its upgradations. Beam like the conch carries the memory of the Kochi port in the form of sound codes and rhythms. The conch like human ear is strategically reactivated through visual suspension in order to listen keenly to the sea, the ship, the port and its people. The rhythm of the sound installation will softly and rhythmically emit its codes from the past and present. As mentioned earlier, Lane has crafted the sound fragments into a wave form. The busy and vibrant port during its colonial past is a remote memory to the present remains of it. Beam has the rhythm of the Morse code constituted by fragments of human voices, the trickling and swishing sound of the water, punctuated by the sound of decompression of the ships, while mooring in the sea. All sound units are against a background of the relentless and tireless sound of the waves—a common denominator to the new and old dwindling harbor. The resonances of the waves are repeated in the microcosm of the sea conch and so the sound installation transmitted to the human conch must continue to resonate involuntarily and repetitively. The sonic Beam will again and again continue its refrain as a memory of a fading port that may soon become a memory or is already a memory encroached by scheme(s)-ing development. Technological up-gradations particularly in the form of automization de-populates one group of people and repopulates with another; a new upwardly mobile class is displacing the teaming activity of the working class on the harbor and thus changing the social and physical geographies of seascape and port. 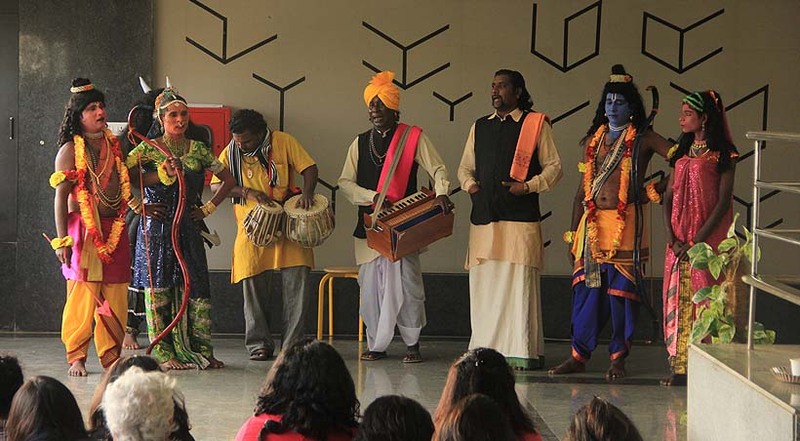 Vasanthi Mariadass is a faculty at Srishti Institute for Art, Design and Technology with a background in Contemporary Theory and Film Studies. She is interested in Experimental, Avant-garde, Documentary and Essay films, Cultural Studies and Contemporary Art. Currently she is working on Film and Installation work by Harun Farocki, Hartmut Bitomsky, Werner Herzog and Jean-Luc Godard. BBC New. “Slavery ‘Worse’ 10 year after Moracambe Bay Tragedy.” Last modified 5 Feb. http://www.bbc.com/news/uk-england-25914594, 2014. Derrida, Jacques. “Otobiographies: The Teaching of Nietzsche and the Politics of the Proper Name,” In The Ear of the Other. Translated by Avital Ronell. Lincoln: U of Nebraska, 1985. – – –. Margins of Philosophy. Translated by Alan Bass. Chicago: U of Chicago. 1986. Deleuze, Gilles and Felix Guattari. A Thousand Plateaus. Translated by Brian Massumi. Minneapolis: U of Minnesota, 1982. Forgotten Space. Film Essay. Allan Sekula and Noel Burch, 2010. Lane, Cathy. Beam. Sound Installation. Kochi: Artry Gallery, 2015. Nayar, Parvathy. The Fluidity of Horizons. Installation. 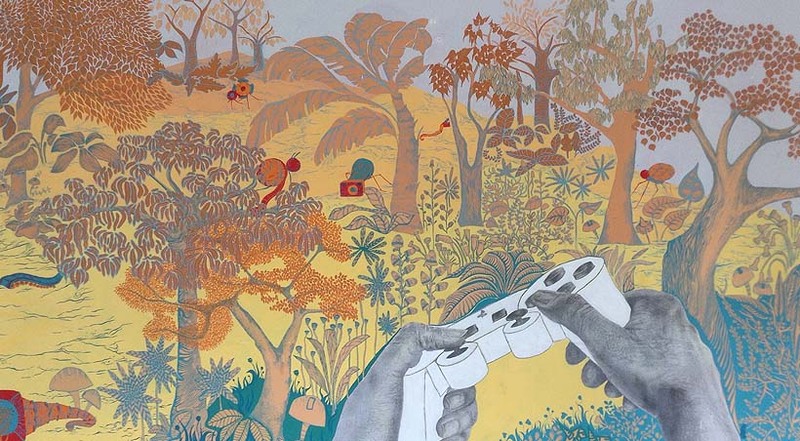 Kochi: Kochi Muzuris Biennale, 2014-15. Sekula, Allan. Fish Story. Dusseldorf: Richter Verlag, 1995. Ten Thousand Waves. Film Installation. Isaac Julien, 2010. The Guardian. “Morecambe Bay Cockle Pickers Tragedy.” Last Modified 20 June. https://www.theguardian.com/uk/2007/jun/20/ukcrime.humanrights, 2007. Woolf, Virginia. To the Lighthouse. New York: Harcourt Brace, 1927. Woolf, Virginia. Waves. London: Hogarth, 1931. Wikipedia. “2004 Morecambe Bay Cockling Disaster.” Last Modified 5 June. https://en.wikipedia.org/wiki/2004_Morecambe_Bay_cockling_disaster, 2016.